The open case studies on this site are open educational resources, or OER. They are openly licensed, which means they carry specific licenses that allow you to reuse them in particular ways. In addition, because the UBC Wiki is a publicly-viewable website, there are copyright restrictions on what can be uploaded to the wiki and added to the case studies. This guide is designed to explain these and related topics. 1 What are open educational resources? 2 What are open licenses, and how are these case studies licensed? 3 How can I find and attribute openly-licensed works to add to the case studies? "teaching, learning, and research resources that reside in the public domain or have been released under an intellectual property license that permits their free use and re-purposing by others. Open educational resources include full courses, course materials, modules, textbooks, streaming videos, tests, software, and any other tools, materials, or techniques used to support access to knowledge." Thus, OER are any teaching and learning materials that are made available to others to use without cost, and with an open license that allows them to reuse, revise and redistribute them. They can be anything from syllabi, lecture notes, presentation slides, videos, podcasts, assigned readings, instructions for doing various kinds of assignments, and more. Many OER are resources that instructors are already using for their courses that they make available for others to revise and reuse. Sometimes students create OER as part of their work in courses. The case studies on this website are open educational resources, but note that they may have varying open licenses on them that provide different levels of permissions. See the next section for an explanation of open licenses. What are open licenses, and how are these case studies licensed? When an author creates a work, Canadian law automatically grants them full "copyright" over their work. This means that nobody may copy their work or make changes to it, except with the author’s express permission, or in accordance with the user rights granted by the Copyright Act (e.g., fair dealing). Put another way, if you want to use a work in way that doesn’t qualify as a user right, you can only use the work as permitted by the copyright owner. The granting of permission is referred to as "licensing." Some copyright holders restrict all rights to their work, and so you have to ask their permission to use their work. Others, however, proactively offer their work to the public on standard terms that allow anyone to use their work so long as certain terms and restrictions are complied with. Most open licenses allow for content to be used, modified and built upon, but some licenses provide more permissions on how the work may be reused than others. The type of permissions given to a user of the openly licensed item depends on the creator and the license they have assigned to their work. The benefit of open licenses are they allow the creator to select the permissions and restrictions according to how they would like their content used. Creative Commons is a non-profit organization whose mandate is to make it easier for creators to share their work and/or build upon the works of others consistent with the rules of copyright. They have created standard, easy to use and understand copyright licenses that anybody can apply to their work to allow others to share, remix, or use the work without having to contact the copyright owner to ask for permission. Creative Commons licenses are not an alternative or exception to copyright, they are one way for copyright owners to distribute their work within the copyright framework. 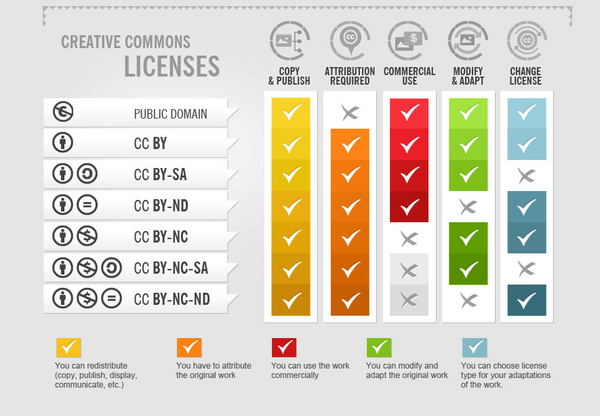 There are several Creative Commons licenses, each with a different level of use restrictions. Please see here for a list of CC licenses (an overview is provided below). If you want more information about Creative Commons, the licenses, or how you can use CC-licensed materials, the Creative Commons FAQ is a good resource. The case studies have the Creative Commons Attribution license (4.0), which means that anyone can use them for any purpose, so long as the original creators are attributed. Because these case studies are collaboratively created and revised by both faculty and students, you may attribute the original "author" as the UBC Open Case Studies, giving this website as the source. How can I find and attribute openly-licensed works to add to the case studies? Just because something is available online doesn't mean you have permission to re-use it by posting it on another website. The creator must have given permission for the work to be re-used (or revised, if you want to change it), which can be done by an open license. Another alternative is to find works in the public domain, though determining what is in the public domain can be tricky--see the UBC Copyright guide on public domain works. Open Education Research Guide - a curated list of openly licensed resources including, open textbooks, open journals, and multimedia resources. Finding & Using Creative Commons Media - UBC - a curated list of sources for openly licensed resources, images, music, video, etc. which you can embed - with attribution- in any resource you create. Purdue OWL's online guides to citing electronic sources. This page was last edited on 29 October 2016, at 20:58.